Not for the faint of heart, but if you are training for a mountain ultra, hill repeats on Diamond Peak are a great way to go. 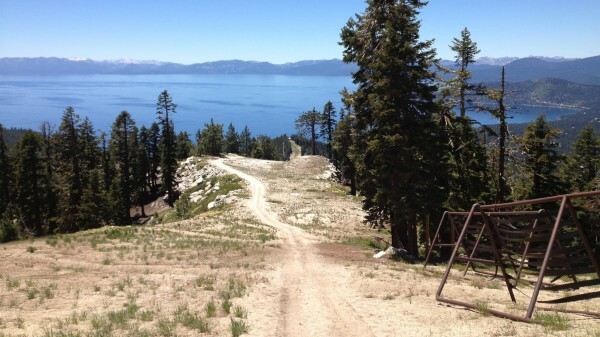 This climb is also part of the Tahoe Rim Trail (TRT) 100 and TRT 50-mile course. Diamond Peak Ski Resort is located at 1210 Ski Way in Incline Village, NV. Click here for driving directions can be found on their website. For summer parking, continue to the upper-most parking lot, which is about 1.25 miles up Ski Way from Country Club Dr. There are NO FACILITIES available in the summer, so plan accordingly. The brown snow fences (lower right) are your only indication that the top is near! The route is fairly straightforward: climb 1750′ on the crushed granite road/ski run for 2 miles to the top, then turn around. Enjoy spectacular Lake Tahoe views as you descend. Repeat? Specifics: Stay on the primary sandy road all the way to the top. In the beginning, when you see the “Red Fox” chair lift, continue straight (don’t turn right). Then follow the road to the right just past the “Crystal Express” chair. Later, there is brown and yellow lift ~ follow the road as it hairpins around this one. The road gets steeper from here. Keep going to the top. Training Tips: Keep moving up the hill at any pace and don’t stop until you get to the top unless you must to stay safe. Know that there are several false summits and that the steepest section is the final 1/2 mile. Give yourself more time than you think you will need and refill water from your car.